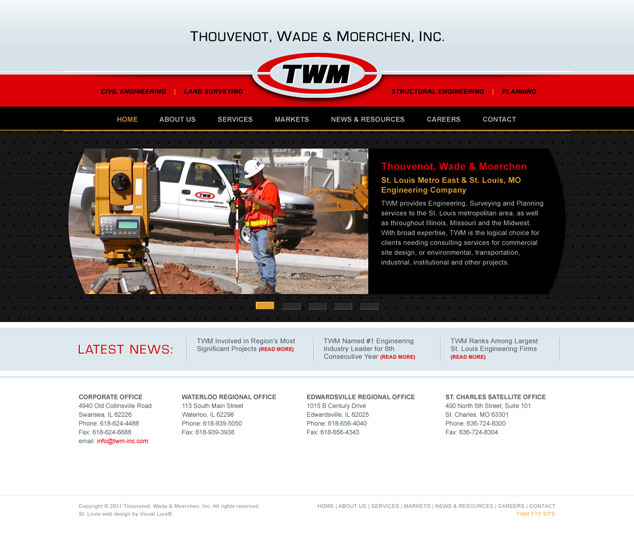 Visual Lure is in the process of designing a new website for Thouvenot, Wade & Moerchen (TWM). They are a full service engineering firm with offices in Swansea IL, Waterloo IL, Edwardsville IL and St. Charles MO. They specializing in civil engineering, land surveying, structural engineering and planning and serve St. Louis, MO, the St. Louis Metro East, Illinois and Missouri. Here is a sneak peek at our proposed home page design. The website will be built in WordPress which will allow TWM to maintain their website with ease. Check back soon for the launch of the new website.